We've Got You Covered - Our remote technical support client provides instant, secure, and trouble-free support, resolving your issues faster. SysConnectors is cross-platform, so we can easily maintain or fix issues on Windows, Macs, iOS, Linux PCs or Android devices. SysConnector is the remote support tool of choice for many of our clients. Most of our clients choose to set up unattended access, giving System Networks permanent remote access to your system without you having to give any passwords or confirm anything. As long as your system is on, we’ll be able to access it remotely. This is primarily done to do preventative maintenance or fix your computer while you’re not around. If you only want technical support for the one time, we will de-authorize the connection on our end once the issue is resolved or you can uninstall the agent under Add & Remove Programs and our connection will be disabled. To begin click the link below. Give us a call, then click the blue "Remote Technical Support" link, download and install the client. Once it is installed, we will fix your issue. It's that easy. Click the "Remote Technical Support" button. 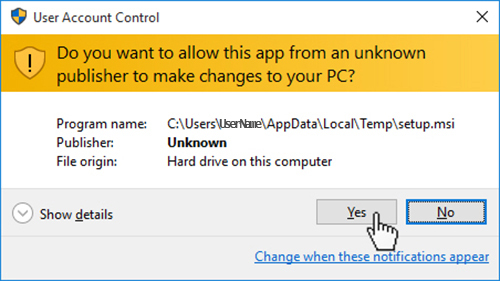 Click the "Yes" button to grant the installer permission to install. We can now connect to your computer and resolve your issue.